There’s not a second to waste in the case of a real health emergency.When an ambulance is called to a non-emergency, it puts the lives of people in a life threatening emergency at risk. 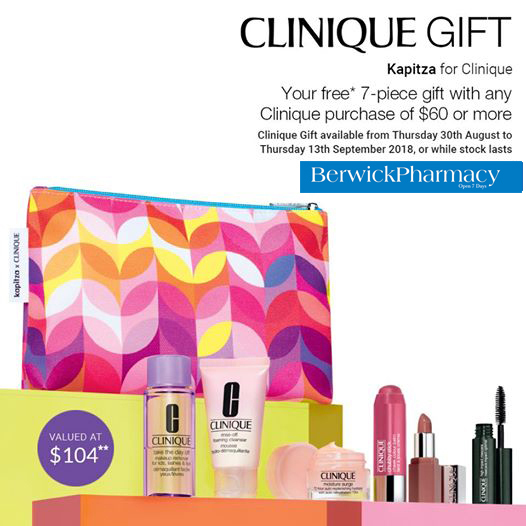 It’s CLINIQUE GIFT TIME at Berwick Pharmacy ! This is Michelle, one of our dispensary technicians. Michelle has worked with us at Berwick Pharmacy for 8 years, so many of you would have seen her smiling face. We have our Natio Gift With Purchase offer on at the moment. Simply spend $38 on any Natio products, and receive this four-piece gift free! Gift includes 3 full-size products plus your choice of cosmetics bag in petal white or dusty pink. Available for a limited time at Berwick Pharmacy .